Scientists are yet to unravel all the mysteries about the tiny and yet complex three-dimensional particles. Key details about their properties and their effects remain elusive. So far, it has not been possible to make reliable measurements to determine their distribution and properties on a global scale. Large uncertainties remain in estimating the magnitude of various aerosols emitted from different sources. Studies based on indoex data are quite preliminary in nature, however, latest results provide an indication of their potential to impact climate scenarios, rainfall and agriculture. The indoex experiment showed that aerosols could be transported to long distances away from the emitting region. Soot lodged in sub-micron sulphate and organic aerosols was seen in distant south showing that these have a lifetime of over a week. The project also fuelled doubts about similar large-scale transport of pollution occurring in other regions of the Earth. Pollutants from Asia are being transported across the Pacific Ocean by winds. Massive dust storms in Asia, which also carry sulphate and organic aerosols, transport soil eastward to Japan and across the Pacific to the us. However, developing countries have borne far worse consequences of industrialisation than the Northern countries. 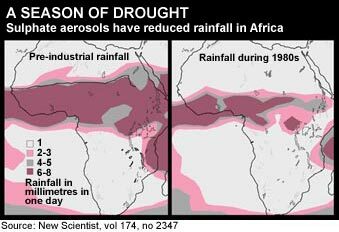 A recent study by Leon Rotstayn and Ulrike Lohmann, Dalhousie University, Australia, has revealed that sulphate aerosols formed upon oxidation of sulphur dioxide emissions from industries in North America and Europe may have been responsible for causing severe droughts in the Sahel region of Africa in the 1980s. Precipitation in this region has fallen by between 20 and 50 per cent in the last 30 years. Also, these emissions may have led to a greater rainfall in Australia as the tropical rain belt shifted southwards (see map: A season of drought). On the other hand, dust storms from Africa's arid Sahelian region, which can rise up to four kilometres into the sky, travel across the Atlantic Ocean to Florida and put about 500 million to 1 billion tonnes of dust into the atmosphere. The incidence of dust clouds reaching Florida has increased since the drought in the Sahel region. Transcontinental dust clouds originating from Asia and Africa are the most significant for North America as itcz along the equator acts as a sort of wind barrier to separate the storms of the Northern and Southern Hemispheres. The Sahel region, the Sahara desert, the Indus valley in India, the Taklimakan desert north of the Himalayas and the Gobi desert in Mongolia, are a few main sources of dust in the world. Surface wind blowing at high speeds over the desert and low sparse grassland regions in Mongolia and western China can inject enormous plumes of dust high into the atmosphere. These are then transported as far as the Pacific Ocean basin before being depleted by rain or gravitational pull. Compared with the clouds from Africa, Asian dust shows higher concentration of human caused air pollutants such as sulphates, perhaps due to Asia's dense population and industrial cities. For instance, dust storms from the Mongolian region start from severely eroded soils, due to overgrazing and overfarming, and as these dust clouds pass over Beijing and other large cities, they gather industrial pollutants. Apart from the health effects associated with particulate matter, mineral constituents of dust present an added hazard (see box: Killers at large). Fine iron particles, which give the reddish tinge to the African dust, can generate hydroxyl radicals on the lung surface, which can scar lung tissue over time and decrease its effectiveness. Another important feature of transcontinental dust clouds is the microbes they transport. Initially it was believed that ocean distances were too large for bacteria to survive, but research points that intercontinental dust may transmit viable pathogens. In thick clouds of dust, the uv exposure at the bottom can be just half of that at the upper surface, so microbes in the lower layer can be protected and can survive the transport. Pathogens carried in dust can cause skin infections such as rashes and open sores, and may affect crops like cotton, peaches and rice. Indirectly, dust aerosols can impact nutrition by reducing crop yields -- through erosion of soil nutrients and by shading crops from needed uv light. They also cause allergic reactions and diseases. Lifetimes of most anthropogenic aerosols are in the range of 5 to 10 days. If aerosols are mostly confined to an altitude of one kilometre, they can travel about a thousand kilometre in so many days. But when lifted to higher layers, like in case of the indoex haze where maximum concentration of aerosols was at about three kilometres, aerosols can travel half way around the globe within a week. While emerging research has answered some questions, many nagging ones remain unanswered. Does the haze balance the warming due to greenhouse gases (ghgs) or does it intensify it? How does air pollution from Asia affect worldwide concentrations of pollutants? Since indoex was conducted during January to March, there is no data on the extent of the haze during the rest of the year. Scientists like Mitra caution that a lot more research is needed on the effect of haze on monsoons, effect of reduced sunlight on water budget and soil moisture to be able to make any conclusive statements. He suggests a holistic policy framework taking into consideration ghgs, aerosols and short-lived gases to emphasise interactions between global processes like warming of the Earth due to ghgs and, local and regional processes like air pollution (see chart: Pollutants at work). In short, we need to learn more. But we also have to act on the basis of what we know today. Some people are beginning to think that the heat absorbing soot is a godsend as it may help to reduce global warming. Nothing can be further from the truth. As scientists working on indoex show, the short-term fix of aerosol cooling could well be deadly for the regional climate -- its rainfall and sunlight. By making the region, more drought-prone, it could act as a double-whammy, with vulnerable people becoming even more vulnerable to the impacts of global climate change as they occur. But as Mitra says, it is important to distinguish between the causes and impacts of greenhouse gases, with lifetime ranges of decades to centuries, from aerosols. However, this should not take away from the need to learn more about the impacts of aerosols -- on the health of people to the health of our local climate system. Interestingly, the action agenda, in both cases, greenhouse gases and regional haze is complementary -- to reduce emissions from fossil fuel burning. But the actors will be different. In the case of global warming, the first accused, is the industrialised world, which is continuing to emit, far beyond its share of the global atmospheric space. Its emissions -- from its era of industrialisation, have added to the concentration of gases in the atmosphere. This historical or grandfathering of the atmospheric pollution load, is what is creating the problem today. Developing countries have little space for economic development. Climate change policy is, therefore, about creating the ecological space for developing countries to grow, by limiting the emissions of the industrialised world. In the case of regional haze, the accused are the users of fossil fuel in the developing world -- from thermal power plants, to automobiles and to burning of biomass. The 'survival' emissions of the poor -- to burn firewood to cook food -- cannot be compared with 'luxury' emissions of the rich -- to drive a car, for instance. Therefore, in this case, the onus of change lies with the rich of the fast developing world. We have to recognise, and fast, that air pollution is doing more damage than just killing us softly.